We’d love your help. Let us know what’s wrong with this preview of DEADLY PASSION by Joe Congel. Two women dead: One a twenty-year-old cold case, the other brutally fresh. Both had their lives cut short and their hearts cut from their body. 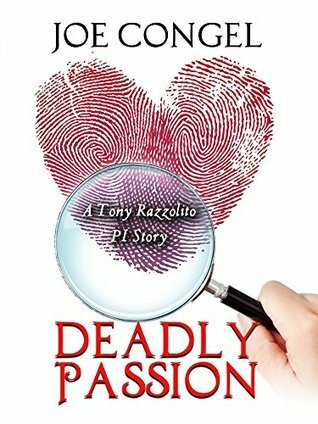 PI Tony Razzolito, working for his favorite pro bono client, can’t seem to stop second guessing the results of the police’s original investigation as he works to put the pieces together to solve the twenty-year-old murder. And now, Two women dead: One a twenty-year-old cold case, the other brutally fresh. Both had their lives cut short and their hearts cut from their body. And now, as the cops are deep into trying to figure out who committed the new crime, the clues appear to keep leading back to the same suspects from the cold case. And to make matters worse, Tony keeps finding himself stepping on the toes of the seasoned homicide detective who was never able to solve the original murder the first time around. To ask other readers questions about DEADLY PASSION, please sign up. What ultimately drives one human being to murder another? To take away everything they are and will ever be. To snuff out a life which once shone bright with hope and dreams. In the majority of cases it has to do with some form of emotional investment. The power of emotions such as love and hate can be exceptionally strong. Be that as it may, it is a cruel and evil deed which society has no mercy for. The powers that be will hunt down such vicious killers with every resource they have at t What ultimately drives one human being to murder another? To take away everything they are and will ever be. To snuff out a life which once shone bright with hope and dreams. In the majority of cases it has to do with some form of emotional investment. The power of emotions such as love and hate can be exceptionally strong. Be that as it may, it is a cruel and evil deed which society has no mercy for. The powers that be will hunt down such vicious killers with every resource they have at their disposal. However, what happens when that is not enough? When a murderer evades capture and punishment for their crime and continues to kill? This is the point in time when the best of the best become involved...and ensure justice is served. In the novel Deadly Passion by author Joe Congel, we get to see this very same scenario unfold. If you like your murder mysteries peppered with intense human emotions, betrayal and ingenious sleuths... then this novel will provide what you seek! The story revolves around the brutal slaying of two women. They were both butchered in exactly the same fashion- stabbed to death with their hearts cut out from their body. The puzzling matter however is that the two murders happened 20 years apart from one another. The first case was never solved. Could a sadistic killer who escaped justice the first time around be back in business? Enter Private Investigator Tony Razzolito. He is the cream of the crop when it comes to gumshoe detectives, and has been brought onboard for this case by the police brass themselves. Of course, this does not sit well with the original homicide detective who was unable to solve this senseless murder decades ago. Forced to work together, the two must put their differences aside and stop a sadistic killer before they strike again. To write out the plot for a great detective/murder mystery is no easy feat. It must contain a number of key elements to be believable and thus successful. For instance, there have to be victims, suspects, puzzles, clues and a number of breathtaking twists and turns. All of this needs to be presented in a way in which the reader becomes a virtual participant in the process. They are solving the crime alongside their favorite detective! When this all comes together you end up with true reader engagement. This is exactly the case with Deadly Passion. The theme of love and revenge is brilliantly supported by exciting and edge-of-your seat story events. The reader becomes emotionally involved in the process which in turn is exceptionally powerful in creating a captivated reading audience. While the plot of this novel is beautifully written, I do believe it essentially remains a character-driven story. There are a number of significant players in this tale who develop and grow in great detail. From Razzolito and Scott to Cahill and Havens. We get to learn more about the variety of characters, and what drives them, with each passing page. Once again the reader becomes emotionally invested and interconnected with them and their particular plight. What's more, by utilizing his unique writing style and point of view, the author allows us insight into the minds of victims and villain. Engagement at its best! Overall, I loved this novel. While the story events are intelligent and intricate, it remains easy to read. This is due to the smooth writing and crisp dialogue which seamlessly flows from page to page. If you are in the mood for a classic and enthralling murder mystery... this is the book for you! Undeniably a true page turner.